In fall 2015, the College of Arts and Letters will launch a new Collaborative Innovation program that focuses on the principles of design thinking—a powerful approach for solving real-world problems. “A dynamic, iterative, and deeply human process, design thinking prepares students for the type of collaborative, cross-disciplinary work they will encounter after graduation, no matter what career paths they pursue,” said Richard Gray, chair of the Department of Art, Art History, and Design, which will be home to the new program. 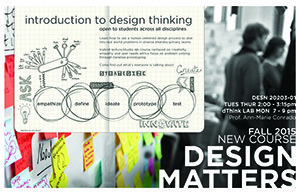 The program features a new introductory course called Design Matters, which is primarily intended for first-years and sophomores. Students in the class will not only learn design thinking and the theory behind it, but will also work in teams to apply the methodology to real-world problems, said Ann-Marie Conrado, assistant professor of industrial design. Design Matters, which combines lecture and lab components, is divided into three primary areas of focus: insight, ideation, and implementation. During the insight stage, students work to identify and understand a problem by researching users, their needs, and the context, developing empathy along the way. In the second stage, they generate as many ideas as possible and rigorously evaluate each one. The culminating experience of the five-course Collaborative Innovation program will be a hands-on capstone class called Collaborative Product Development. Working in teams with corporate partners, students will get a chance to address existing needs and solve a variety of problems—from global distribution to product innovation to community outreach. In fall 2015, Collaborative Product Development students will work with SAP, a multinational software corporation, to focus on the future of wearable technology in an enterprise environment. Throughout the semester, Michael Brown, vice president of design at SAP, will serve as a client, evaluator, and mentor during multiple campus visits and regular Skype conversations. At the end of the course, the students will present their work to venture capital firms and SAP executives. “These students will have an edge as they enter the job market because they will have experience working on real enterprise problems with available technologies, creating a more viable portfolio,” Brown said. The Department of Art, Art History, and Design has been offering Collaborative Product Development for the past four years, pulling together students from anthropology, marketing, design, engineering, and architecture. In previous semesters, students in the course have collaborated with various commercial organizations and social entities, regionally, nationally and internationally, including communities in Nepal and Haiti. The Collaborative Innovation program, Down said, opens the door for creativity and entrepreneurship and creates empathy and respect for colleagues in different disciplines. Conrado agrees, noting that the program will also allow students to see just how effective these collaborations can be. “In this humanistic approach to problem solving, students come up with a solution together that is beyond the scope of what any one discipline would be able to achieve,” she said. Originally published by Carrie Gates at al.nd.edu on March 31, 2015.